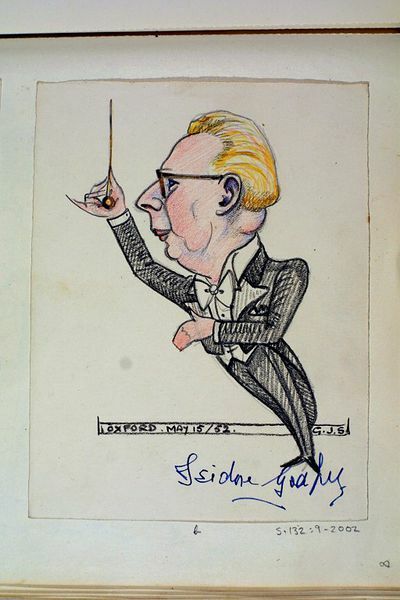 This caricature shows Isidore Godfrey (1900-1977) conducting the D'Oyly Carte orchestra in a performance by the D'Oyly Carte Opera Company at the Oxford New Theatre in May 1952. It was drawn by Gilbert Sommerlad (1904-1976), a rehearsal pianist and orchestral violinist at the Brighton Theatre Royal from 1932 until 1936, and at the Oxford New Theatre from 1936 for over forty years. Sommerlad sketched the stars on stage when he wasn’t needed in the orchestra pit, compiling the sketches in a series of albums. Isidore Godfrey, the conductor, trained as a pianist at the Guildhall School of Music, joined the D'Oyly Carte Company in 1925, and was its Musical Director for over 38 years from 1929 to 1968, taking the company to America 11 times. Pencil, ink and watercolour caricature of the conductor Isidore Godfrey at the Oxford New Theatre. Dated 15 May 1952. From a hard-backed sketch book containing caricatures of theatrical performers and entertainers drawn by Gilbert Sommerlad. This caricature comes from an album of caricatures of theatrical performers and entertainers drawn by Gilbert J.Sommerlad (1904-1976) between December 1951 and October 1957 at the Oxford New Theatre. Gilbert Sommerlad moved from Brighton to the recently built New Theatre, Oxford, to join his brother Roy (violin and clarinet) as resident pianist in 1936. He continued with his caricatures until his retirement. 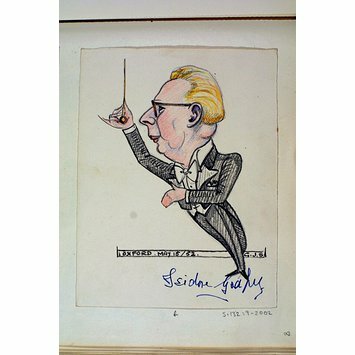 Pencil, ink and watercolour caricature by Gilbert Sommerlad (1904-1976) of the conductor Isidore Godfrey at the Oxford New Theatre. Dated 15 May 1952.